Looking for the best places to stay in Costa Rica for couples? I think you’ll agree with me when I tell you that Costa Rica is one of the most beautiful places on Earth. If you don’t agree with that statement, it’s most likely because you’ve never been to this magical place. I also think you’ll agree with me, that in our busy everyday lives, whether we’re parents or not, it’s hard to find the time and the right place to just reconnect with our spouse or partner. There are some amazing places that focus on helping couples reconnect. Costa Rica, in particular, is an amazing place. It not only features pristine white sand beaches, but also jungles, rain-forest, volcanoes, abundant wildlife, and friendly inviting people. While Costa Rica is certainly family friendly, and I have been there with my kids on many occasions, it is an outstanding destination for couples. So in this post, will explore the beauty of Costa Rica and what makes it so special. We will answer all of the top travel-related questions and really get to the heart of why you need to visit. Specifically, will look at the best places to stay in Costa Rica for couples. 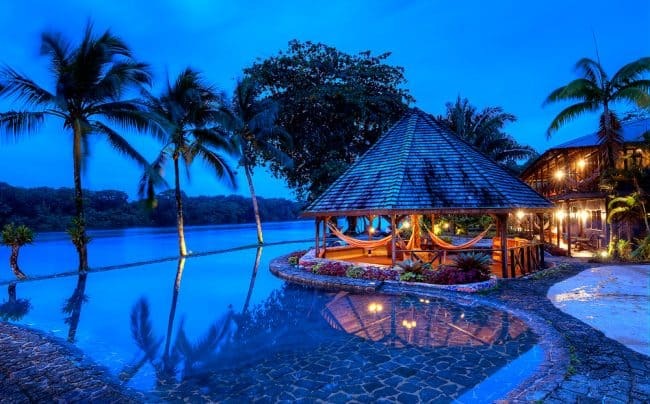 Places that will allow you to enjoy all of the beauty and amenities Costa Rica has to offer. But places that will really let you connect with your spouse or partner and get back to the heart of what really matters. Make sure to check out my Costa Rica Couples Travel Resource List with links to everything you need! While you don’t need to be fluent in Spanish to visit Costa Rica, why not learn Spanish the Rocket Way? Just a few minutes a day is all it takes! 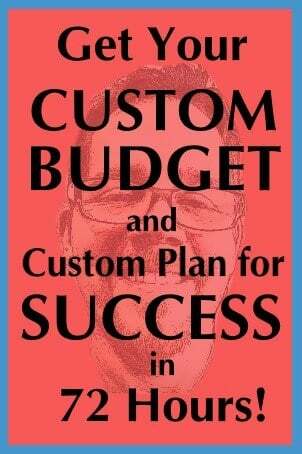 Over 2500 reviews and a 4 .7 star rating tell it all! Learn more with a FREE TRIAL of Rocket Spanish. What is the best area in Costa Rica to stay? Bear in mind anytime we use the word best, it’s subjective. ALL of Costa Rica is beautiful. Friendly people are everywhere and the wildlife is abundant. That being said, what’s most important to you? Travel time from the airport? For me, I prefer the state of Guanacaste which is northern and on the Pacific side. It’s easy to get to from the Liberia airport. I also don’t have the stress of trying to drive in San Jose, the Capital (think driving in NYC). The Pacific side is also easier to get to than the Caribbean side. Plus I still get amazing beaches, volcanoes, wildlife galore and so much more. Ready to dive deeper into why I love this area? Check out ALL the amazing Reasons to Visit Guanacaste Costa Rica! Does Costa Rica have all-inclusive resorts? 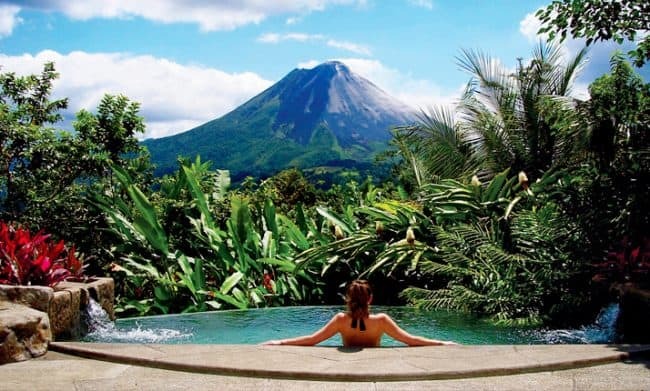 Being one of the world’s most beautiful travel destinations, Costa Rica, of course, has many of the top-name hotels and all-inclusive resorts. Whether you’re looking for a top notch hotel chain like the Westin, The Four Seasons or JW Marriott, you can find that in Costa Rica. 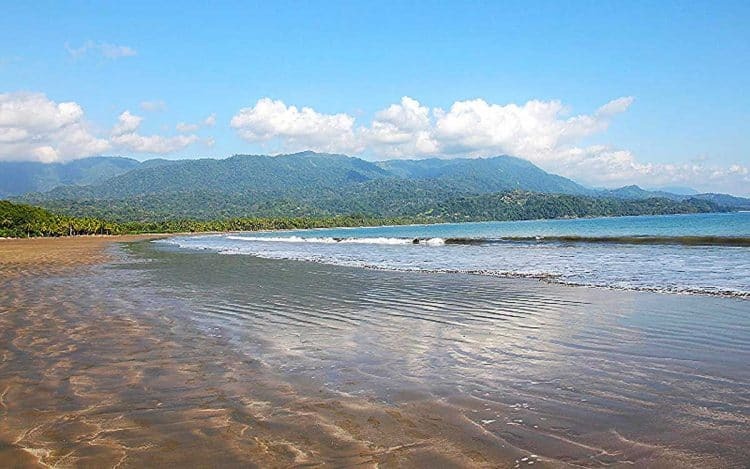 But the #1 ranked All Inclusive resort in Costa Rica is Rio Perdido located in the jungle forests just a short drive from the Liberia airport. Click the image to see more on why Rio Perdido is most certainly one of the best places to stay in Costa Rica for couples. Where should I stay in Costa Rica to see wildlife? Want to see macaws in the wild? In my 5 visits, I’ve only ever seen these magnificent creatures once, around the surfer beach called Jaco. I’ve never seen a toucan there (in the wild). Howler monkeys are abundant and I’ve seen them (and heard them) up and down the Pacific coast. They travel in packs and live in the trees. Bear in mind their howl is not unlike a lion’s roar and can travel up to 3 miles. Let’s hear a howler money! But if you’re observant, you can see all kinds of wildlife everywhere in Costa Rica. There are also some great places to do guided nature hikes and walks. My daughter’s and I love hand feeding the white-throated magpie jays that live in the northern-most part of the Guanacaste state. Think blue jays with a black mohawk and a long parrot-like tail. The locals think of them the way Americans think of pigeons, but we loved them anyway. Not sure when to start planning your next vacation? Waiting too long can cost you more or cause you to rack up a lot on credit cards. So I highly recommend you take a moment and review all my most crucial Summer Vacation Planning Steps. What is the best airport to fly to Costa Rica? I love the Liberia airport. In fact, it’s the only airport I’ve ever flown into in my 5 visits to Costa Rica. While I have flown into the old one where they roll up some stairs to meet the plane, the current airport is modern. It has everything a modern airport in the US has even down to a Quiznos. The main reason I love it is that I can be at some of my favorite destinations within 1 hour (and many in close to 30 minutes). I also don’t have to hassle with driving in busy San Jose! Plus, living in Texas, it’s only a 3-hour flight from Houston! Again, this will be highly subjective. Also, bear in mind I haven’t been to the Caribbean side. 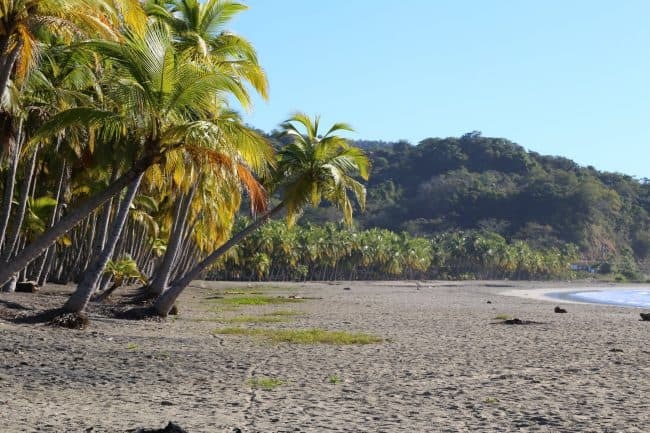 That being said, for me, there’s no better beach than the Playa Conchal area on the Pacific coast in Guanacaste. Don’t believe me? Here are 2 of my daughters playing in the sand there. 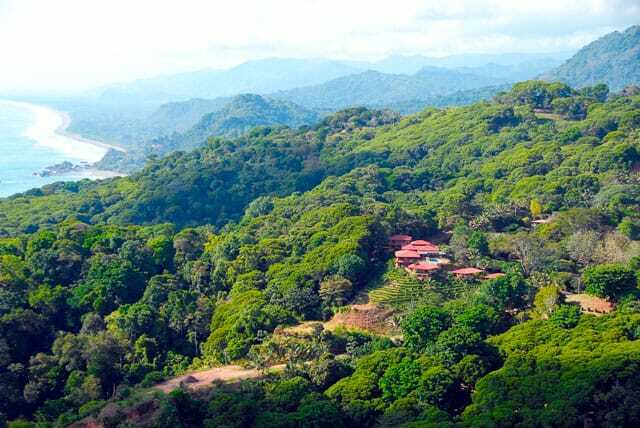 The beauty of Costa Rica is it is pretty much an average year-round temperature of about 79°. Of course, if you’re on the beach it may be a little hotter. In the rain-forest and you can expect much greater humidity. But generally speaking, it’s great weather all year. The summer is considered the rainy season, so from about May to mid-November you can expect very brief afternoon showers. But having said that, I’ve stayed there a week in July and seen almost no rain, so it’s hardly down-pouring the whole time. The so-called off-season can also get you much cheaper accommodations too! Think you’re too broke to go on vacation? 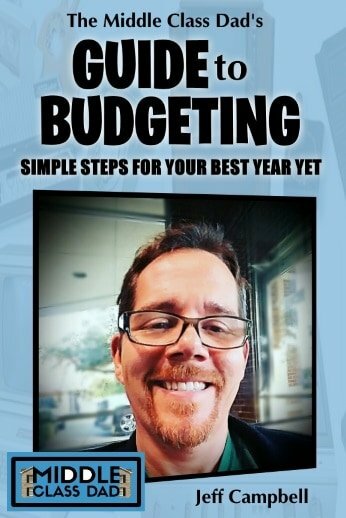 Don’t say no until you check out proven ways to have a Great Vacation on a Budget! So now that we’ve covered the basics, let’s review the . . .
To qualify for my list, hotels and resorts needed to have 5-star reviews with over 400 reviews. They also needed to have a pool, free WiFi and be focused more on couples and less on kids (that does not mean these are necessarily adults only though). 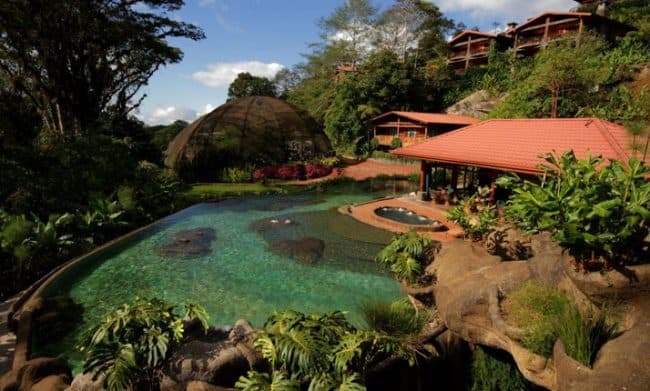 So this list is truly the best of the best places to stay in Costa Rica for couples. These are also not in any particular order. Click the image to watch a video of just how amazing this place is! Rated the #2 resort in the world by Trip Advisor in 2015! Did I mention the espresso bar and also the wine & tapas bar? 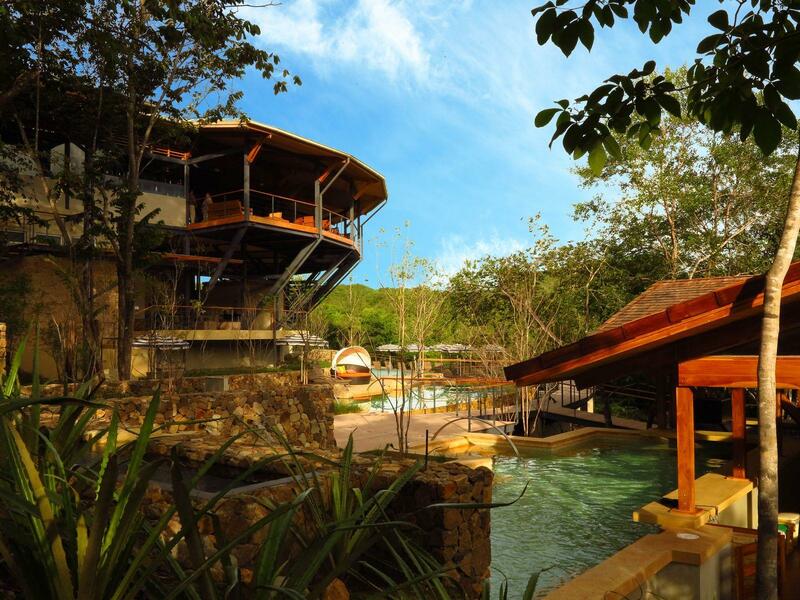 See why Nayara Resort is one of the best places to stay in Costa Rica for couples! See what makes this one of the most romantic getaways in a short video. Click the pic to see more. This gem is in the resort area called Manuel Antonio. Fly into San Jose and then take a scenic drive or fly to the nearby regional airport. Not sure what’s best? Let the resort handle your transportation needs. Voted Best New Honeymoon Spot by The Knot! Since it’s the Only LUXURY BEACHFRONT RESORT in Manuel Antonio, Costa Rica, it’s certainly one of the best places to stay in Costa Rica for couples! As I mentioned, all the properties I’m featuring at 5 stars with over 1000 reviews each. Ready to see why this place is one of the Top 7 Views in the World? Click the image and check out their video! Like the #1 resort, The Springs Resort and Spa can be easily reached from either the San Jose or Liberia airports (but is a little closer to Liberia). If you ever watch The Bachelor or Keeping Up with The Kardishians (count me out on both), then you’ve likely seen this gem as it’s featured in both shows. Voted as one of the 7 Resorts with the Most Spectacular Views in the World by CNN! Check out all the features in a quick video by clicking the picture! 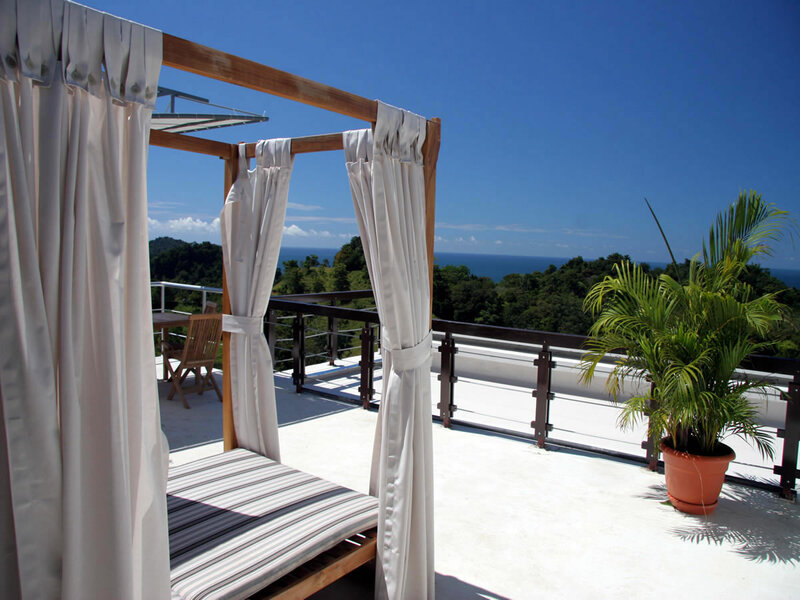 Gaia Luxury Boutique Hotel and Reserve, located in Manuel Antonio Beach, Costa Rica, is a 5-star Eco-friendly resort. Click the pic to watch a video showing you more about the top honeymoon spot! Just north of San Jose near La Paz Waterfall inside a rain and cloud forest lies this hidden gem. The Peace Lodge was featured on the Travel Channel’s “Honeymoon Hotspots International” program as one of the eight most romantic honeymoon destinations in the world outside of the United States. So it’s clearly one of the best places to stay in Costa Rica for couples. Check out what makes this place great by clicing the pic and watching a short video! 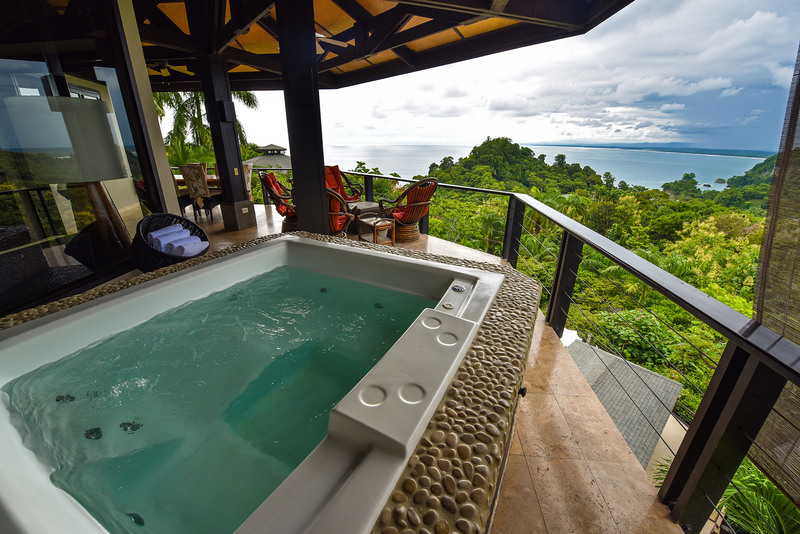 Tulemar Resort is nestled in a lush rain-forest overlooking the Manuel Antonio coastline. Surrounded by nature, Tulemar Resort features incredible gardens, walking paths, thriving wildlife, and the ONLY exclusive sandy beach in the region. 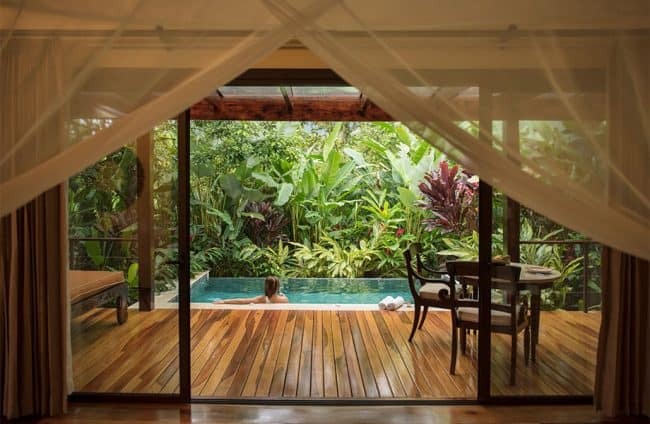 It’s no wonder this resort makes the list of best places to stay in Costa Rica for couples. Watch their video to learn more! Just click the pic. This breathtaking upscale boutique hotel is located in a private cloud forest reserve just a short drive from San Jose. From their beautifully appointed 19th-century re-creation of a mountain farm village to amenities that include wood-burning fireplaces, private garden porches, and in-room whirlpool tubs, you won’t be disappointed. With prices starting at only $164/night, what are you waiting for?? Villa Blanca is amazing! The sister property to my #1 listing above and a no-brainer for any list of the best places to stay in Costa Rica for couples. Whereas the first listing is more resort, this is an exceptional boutique hotel in a secluded place of understated luxury. Located in a rain-forest, the only way in or out is via a canopy bridge as to not disturb the forest. Learn more in a short video. Just click the pic! Watch a video to learn more about this gem. Just click the pic! This hotel can be easily reached from either the San Jose or Liberia airports (but is a little closer to Liberia). Located at the foot of the majestic Arenal Volcano (don’t worry, it is dormant). The husband and wife team who run El Silencio are proud of their heritage and like to like and run the hotel in harmony with nature. Collect farm eggs or milk a cow while you’re there! Check out their video by clicking the pic. One of the few on my list on the Caribbean side! Tortuga means turtle (or tortoise) and August thru November is giant sea turtle hatching season! Stand just a few feet from a 300 lb green sea turtle! Tropical paradise awaits! Watch a short video by clicking the image. Located slightly inland from the tourist paradise of Tamarindo, this boutique hotel just a short drive from the Liberia airport. Click the image to watch their video! Located within an hour and a half of Manuel Antonio, a short drive from the San Jose airport is this gem. Dive in deeper in a short video which walks you through all their features. Just click the pic! Located on the tip of Puntarenas, Casa Chameleon is a surfer’s paradise; “quaint, bohemian and eclectic”. Let Casa Chameleon arrange a flight transfer from nearby Tambar Airport, or drive from Liberia. A short drive down the peninsula from San Jose near Dominical lies this ideal vacation getaway. Located on the tip of Puntarenas, Casa MarBella is the #1 hotel in all of Playa Santa Teresa. Get a flight transfer from nearby Tambar Airport, or drive from Liberia. Drive from San Jose and take a ferry across the Gulf of Nicoya. Driving is about 5 hours from either big airport, but so worth it for the outstanding scenery. Located south of San Jose near Dominical, Rancho Pacifico is a luxury resort located 2000 feet above sea level, offering majestic views of the Pacific Ocean. Did we list all the best place to stay in Costa Rica for couples you were looking for? In this post, we took an in-depth look at what Costa Rica has to offer. We looked at the landscape, the wildlife, and the best travel tips available. We explored all-inclusive options as well as which airport is best to fly into. But more importantly, we looked at the best places to stay in Costa Rica for couples. Places that will really allow you and your partner or spouse to connect in ways not possible in the US or wherever you are from. Come see what makes Costa Rica so magical and truly one of the most breathtaking places on Earth!